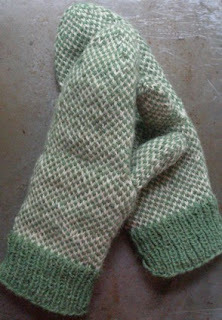 Getting the free mitten pattern loaded up here. This is what they looked like before blocking in Soak. Now they're softer and more rounded and generally a delight to my hands. I've been working hard all week fine-tuning the second size and translating between left and right thumbs, and I think it is time I freed up some desk space for all the other projects in the pipeline, yes? So if you'll excuse me, I have a date with some graph paper.